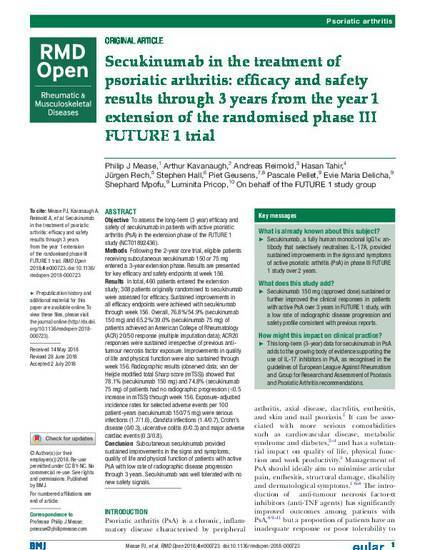 Secukinumab in the treatment of psoriatic arthritis: efficacy and safety results through 3 years from the year 1 extension of the randomised phase III FUTURE 1 trial. Philip J Mease, Swedish Medical Centre and University of Washington, Seattle, Washington, USA. Objective: To assess the long-term (3 year) efficacy and safety of secukinumab in patients with active psoriatic arthritis (PsA) in the extension phase of the FUTURE 1 study (NCT01892436). Methods: Following the 2-year core trial, eligible patients receiving subcutaneous secukinumab 150 or 75 mg entered a 3-year extension phase. Results are presented for key efficacy and safety endpoints at week 156. Conclusion: Subcutaneous secukinumab provided sustained improvements in the signs and symptoms, quality of life and physical function of patients with active PsA with low rate of radiographic disease progression through 3 years. Secukinumab was well tolerated with no new safety signals.